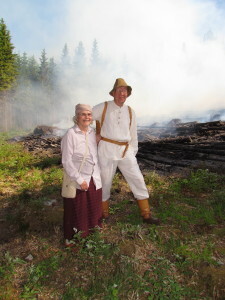 Ilmari (right) with his wife, Suoma, on the left. Martikainen, who was 77-years-old, worked all his life in the village of Koli as a farmer and small-scale gardener. He was instrumental in securing and establishing the Koli National Park, which is an iconic conservation area unparallalled in its cultural and natural significance to Finland. Ilmari Martikainen mastered the oral histories, traditions and ways of life of his homeregion. He worked as a guide and interpreter in the Koli area for thousands of visitors over the years. One of his last works was to complete the Herajärvi hiking trail interpretation using visual histories, i.e. videos of the region. Snowchange worked with Ilmari on the oral histories and cultural heritage of the Vaara-Karjala region between 2011-2013. Since that we maintained close contacts and visits to Ilmari, Suoma and their family. The oral histories and cultural materials of the Martikainen family will be kept and put to good use in the future and we join all of the village of Koli and nationally in mourning.